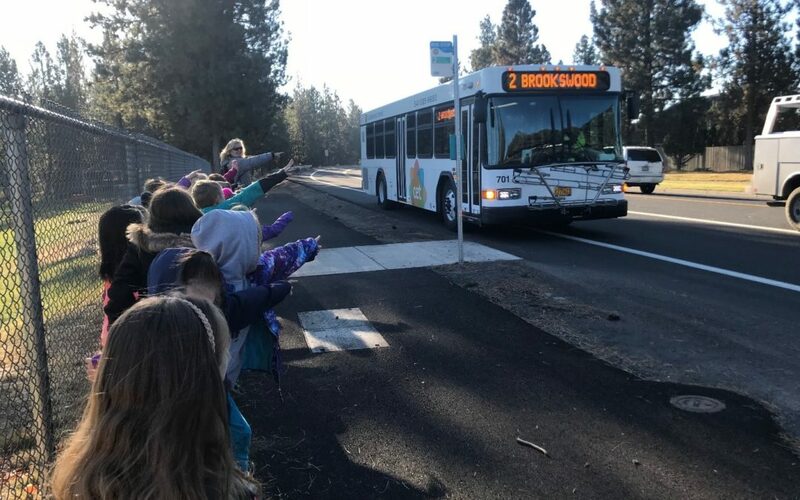 This fall community members boarding the city bus in Bend OR were surprised to be greeted with 22 “Hello, good morning’s!” Teacher Heather Korman at Elk Meadow Elementary School took initiative to teach her students how to use public transportation. Using the Commute Options Transit Safety Curriculum covering both pedestrian and bus safety, Korman spent 2 days walking to the bus stop, observing the reasons why it is important to follow safety steps near the roadway and introducing her students to their transportation system. Collaborating with transit provider Cascade East Transit and recruiting parent volunteers, Korman gave her class the opportunity to ride the city bus. Commute Options coordinated Transit Safety Education at two schools in Central Oregon, working with two different 2nd classes, and reaching almost 50 students this past fall. Looking into the future, Commute Options is empowering teachers with tools to teach this curriculum on their own!